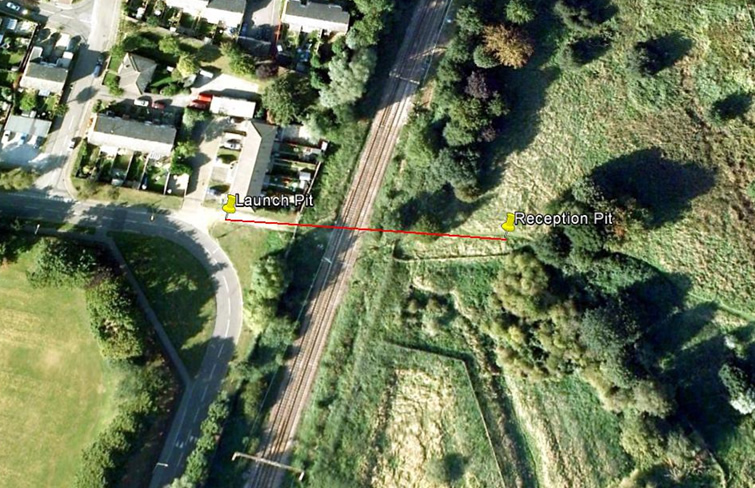 AMS No-Dig was contracted on behalf of UKPN to carry out two directional drills beneath the main Network Rail lines between London and Stansted Airport. The scheme initially required 2 x 225mm o/d ducts and 1 x 110mm o/d duct for electricity cables within one bore. However, due to the excessive settlement prediction highlighted by the settlement calculations carried out during the planning phase of the project, AMS No-Dig�s engineers designed a second option using two bores and presented this to the client. 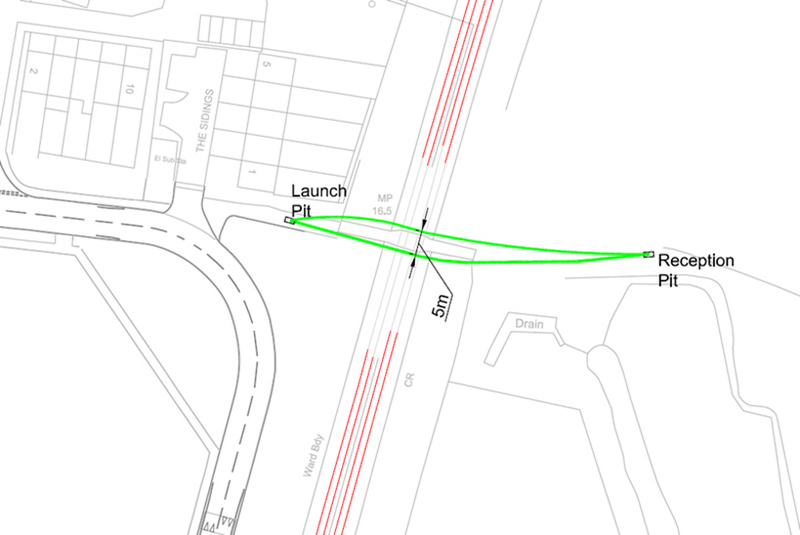 This modified design was accepted by the client and by Network Rail. The first of the two installations contained a single 225mm o/d electric cable duct and the second contained 1 x 225mm o/d and 2 x 110mm o/d ducts. One of these 110mm ducts was designed to be sacrificial in order to reduce the potential settlement, and this was accepted by Network Rail. The project presented many challenges to AMS No-Dig�s engineers. Firstly access to the reception area was difficult due to it being located in a designated Site of Special Scientific Interest (SSSI), and the only possible access to this site involved a very low bridge at the side of the River Lea, with just enough clearance for our Bobcat Utility Vehicle. This vehicle was used throughout the project to transport operatives and small hand tools to the reception area. The next challenge involved gaining acceptance from Network Rail to transport plant and equipment across the very busy London to Stansted rail lines, and also to receive the usual approvals required to drill beneath their infrastructure. When these approvals were received, the equipment had to be transported during night possessions, which lasted less than 2 hours. During the possessions, the client had to spend a period of time positioning track coverings, then AMS No-Dig were allowed to work to a previously prepared timed programme of 8 minutes and 30 seconds during the first possession, followed by 22 minutes and 55 seconds during the second possession to cross the lines with all equipment required. The tasks required during these possessions were planned to the second, and all targets were met. Once the equipment and ducting had been delivered to the reception area, the compound could then be established and equipment could be positioned to carry out the drilling work. The HDD compound was set up within Cozens Lane, and with the assistance of the steering engineer, the first pilot drill was completed to a tight radius through a flint gravel and sand formation. 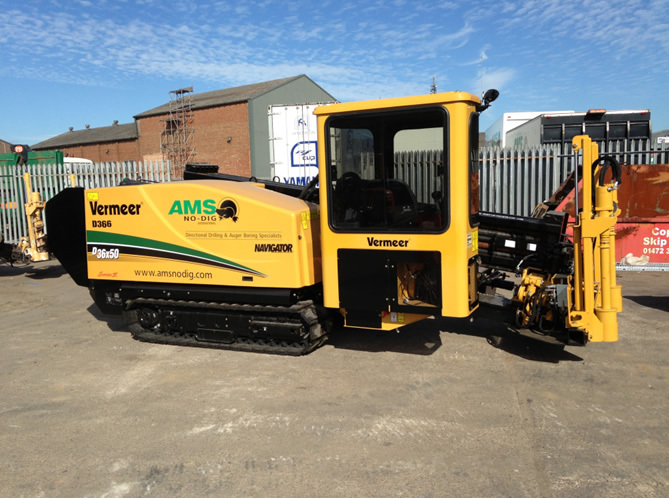 This project was carried out using one of AMS No-Dig�s Vermeer D36x50 directional drilling rigs. The D36x50 series II has a maximum torque of 4995 lb ft (6772.3 Nm), and a maximum pullback / thrust force of 36000lb (16329.3 kN). The wireline guidance technique used on this project provides real time positioning of the drill string. Sensors located within the downhole probe, which is fitted behind the drill head provide constant update of inclination, azimuth and tool face orientation to the surface via a wireline through the drill string. The data is processed using surface equipment (interface unit, laptop computer and a printer), and specialised steering software to provide information on depth, drill distance and distance from the predetermined azimuth (right/left). The probe is 1.75 inches x 3.8 feet, and accuracy of inclination is +/- 0.1, accuracy of azimuth is +/- 0.3 and accuracy of tool face is +/- 0.1. Fluted razor type reamers were used to cut the bores and to stabilise the challenging formations, with the expertise of the AMS No-Dig mud engineers. These reamers were designed and made in house in our fabrication workshop by our own specialist fabricators. Following the successful installation of the first 225mm duct, the project was stood down for one week to allow track monitoring to be carried out 24 hours a day on behalf of Network Rail. This procedure is required to ensure that the correct ground settlement is achieved. The results of the monitoring showed that the settlement was exactly to the design approvals, and as such, AMS No-Dig was instructed to return to site and repeat the process for the second bore. The agreed design and construction programme for the entire project was 26 days, and the project was completed well within this programmed time. All in all, the project was a great achievement by all involved, and in recognition of this, Network Rail produced a reference / thank you document for AMS No-Dig.